would be adjusted annually, without a vote of the Legislature, based on any increase or decrease in the CPI. There is no limit as to how high the tax could go but it could not dip below 21.5 cents per gallon. This proposal to repeal the indexing is now on the November ballot as Question #2. In order to give a more complete picture, we are again listing state legislators’ votes on the repeal of the indexing but adding votes on a transportation package that includes several tax hikes as well as the indexing of the gas tax to inflation beginning in 2015. House 53-95, Senate 8-31, rejected an amendment that would repeal the automatic annual adjustment of the gas tax hike. House 106-47 and Senate 34-6, approved a transportation package that includes an estimated $500 million in tax hikes plus the indexing of the gas tax to the CPI beginning in 2015. Gov. Deval Patrick vetoed the package. The House 123-33, and the Senate 35-5, then overrode the veto and the hikes became law. Patrick said he vetoed the package because it did not raise enough revenue. Other supporters said they reluctantly voted for the package as the lesser of two evils. They said they would rather vote for these hikes than vote to sustain the governor’s veto and have the process start from scratch again with the looming prospect of passage of an even bigger tax package that Patrick wants. Sixteen Democratic legislators who voted in favor of overriding the veto of the tax hikes had previously voted against the hikes. One of these legislators, Rep. Josh Cutler (D-Duxbury), said, “This override was a vote against the governor’s push for even higher taxes. It’s as simple as that.” MassGOP Chairman Kirsten Hughes had a different perspective. 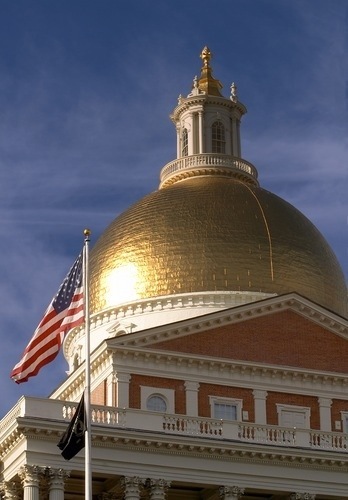 “(Some) Democrats caved in to the Beacon Hill bosses and voted for a massive tax hike that even some Democrats said will hit middle class families hard,” said Hughes. The 16 Democrats who initially voted against the tax hikes and later voted for them include: Sens. Kathleen O’Connor Ives (D-Newburyport) and James Timilty (D-Walpole); Reps. James Arciero (D-Westford), Brian Ashe (D-Longmeadow), Bruce Ayers (D-Quincy), Sean Curran (D-Springfield), Josh Cutler (D-Duxbury), Stephen DiNatale (D-Fitchburg), Diana DiZoglio (D-Methuen), James Dwyer (D-Woburn), Colleen Garry (D-Dracut), Danielle Gregoire (D-Marlborough), Paul Heroux (D-Attleboro), Thomas Petrolati (D-Ludlow), Walter Timilty (D-Milton) and Jonathan Zlotnik (D-Gardner). ALLOW LIQUOR STORES TO OPEN EARLIER ON SUNDAYS (H 228) – Sunday, October 25 is the first Sunday that liquor stores are allowed to open at 10 a.m. Prior to the law going into effect, these stores were prohibited from opening until noon. A total ban on Sunday sales of alcohol was state law until 2003 when it was repealed. Supporters say the measure allows Bay State liquor stores to compete with those in border states that open before noon on Sundays. Opponents say studies have shown the earlier hours do not increase liquor sales but rather spread existing sales out over a longer period of time. FLOOD INSURANCE (H 3783) – A law that prohibits creditors from requiring homeowners to purchase flood insurance in amounts that exceed the outstanding balance of their mortgage took effect on October 21. Other provisions prohibit lenders from requiring coverage for the contents of a home or including a deductible of less than $5,000. Supporters say this would help reduce premiums for homeowners affected by new federal regulations that threaten to drive up the cost of flood insurance. Opponents express concern that the bill would leave some homeowners with insufficient insurance and said the bill protects banks at the risk of homeowners. OFFICIAL GROUNDHOG (H 2864) – Ms. G., the popular groundhog at the Massachusetts Audubon Society’s Drumlin Farm, as of October 29 is the official groundhog of Massachusetts. Ms. G. is the Bay State counterpart to Pennsylvania’s Punxsutawney Phil. The measure also requires that the popular groundhog be used as a mechanism to educate elementary school children on the importance of meteorology. The bill was filed by Rep. Alice Peisch (D-Wellesley) on behalf of elementary school students at the Hunnewell School in Wellesley. Many of these types of bills are filed by legislators on behalf of classes of students as part of an exercise for youngsters to learn about the legislative process. VOLLEYBALL (S 1627) – Volleyball will be the state’s “official recreational and team sport” effective October 29. The proposal was sponsored by former Sen. Michael Knapik (R-Westfield) and Rep. Aaron Vega (D-Holyoke) on behalf of elementary school students at the Maurice A. Donohue School in Holyoke to help them learn about the legislative process. Supporters noted that volleyball was invented in 1895 in Holyoke by William Morgan. Legislation making basketball the “official state sport” (different from the “official recreational and team sport”) was signed into law in 2007. Many Patriots and Red Sox fans disagree with both of these designations. DISABLED VETS’ TAX EXEMPTIONS (H 2617, H 3645) – Two bills that offer tax exemptions for veterans have been stuck in a House committee for more than a year after being given initial approval in October 2013. One bill would make more disabled veterans exempt from the auto sales tax and auto excise tax. Current law offers these exemptions to disabled veterans who buy a disabled veterans license plate for their car. The proposal would also offer the exemptions to disabled veterans who qualify for but have not purchased the special plate. The second measure exempts from the excise tax disabled veterans who lease cars. Current law only provides the exemption for a disabled veteran who buys the car. Last week, Gov. Patrick announced that the state had awarded a $566.6 million contract to CNR MA, a Chinese rail car manufacturer, to supply the MBTA with 284 new Red Line and Orange Line cars to be assembled in Springfield. Some critics said the contract should not be awarded to a Chinese company because of China’s human rights violations. Chai Ling, one of the student leaders in the 1989 Tiananmen Square protests in China. CNR MA President Xiwei Lu. Rep. Byron Rushing (D-Boston), noting the state has refused to do business with countries that have poor records on human rights including South Africa and most recently Myanmar. During the week of October 20-24, the House met for a total of one hour and 37 minutes and the Senate met for a total of four hours and 17 minutes. Mon. October 20 House 11:01 a.m. to 11:09 a.m.
Senate 11:10 a.m. to 3:18 p.m.
Thurs. October 23 House 11:04 a.m. to 12:33 p.m.
Senate 11:02 a.m. to 11:11 a.m.